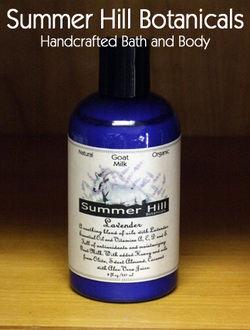 Goat Milk Lotion - Summer Hill Botanicals. Est. 2006. Custom Handcrafted Bath & Body and Natural Skin Care. Total Nutrition Inside and Out. Goat Milk is great for you internally as well as externally. Most people know that drinking Goat Milk is better for your digestion than regular Cow's Milk. Easier to digest and a healthy alternative! For your skin it contains vitamins A, C, D and E. Full of anitoxidants and minerals. Plus, it naturally exfoliates due to Goat Milk containing lactic acid. Our Goat Milk formulas recipes contain honey and oils from olive, sweet almond, coconut with added aloe vera juice. Our Lavender Goat Milk Lotion is very moisturizing for dry, flaking skin. The Lactic Acid in Goat Milk is naturally exfoliating. Goat Milk is rich in Calcium and has many vitamins and other essential elements to help nourish skin. These include vitamins A, E, C, some of the B vitamins, amino and citric acids, unsaturated fatty acids and zinc. Never greasy on your skin!